We encourage the generation and use of robust scientific evidence to guide care. When diagnosed early and treated effectively, childhood eye cancer is curable. No child should die, or suffer avoidable blindness because of it. Many challenges impede scientific research needed to develop evidence based care, but One Retinoblastoma World is breaking down those obstacles. 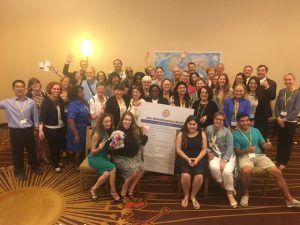 Find out more about how our community is working together to help build a bright future for all affected by childhood eye cancer around the world, and what happened when we gathered in Washington D.C.
Only 10% of children with retinoblastoma live in resource rich countries, where the majority of clinical research takes place. Most researchers work with small numbers of children, and there is very little solid evidence to support retinoblastoma care when eyes may be saved. While more than 96% of children survive eye cancer in developed countries, many endure years of treatment, multiple relapses and moderate to severe loss of sight that is irreversible. 90% of affected children live in less economically developed countries, where clinical research is difficult due to limited resources. 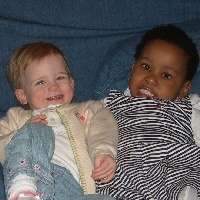 Most children have advanced cancer and the priority is life-saving treatment and palliative care. Poor awareness among primary health workers and parents, leading to preventable blindness in developed countries and preventable death in developing countries. Limited access to best available evidence-based care. Poor collaboration between ophthalmology and oncology. Wide variation in “standard” treatment, and inability to compare outcomes. No universal agreement on pathology findings and post-enucleation care. No standardized outcome measures agreed by the global retinoblastoma research community to enable meaningful, impartial data analysis. Poor study design impeding quality prospective research. Numerous single-institution studies involving small numbers of children, hindering evaluation of the investigated treatment’s efficiency. Lack of randomised clinical trials for intraocular and extraocular Rb. Limited evidence to inform awareness campaigns, treatment decisions or family support programs. Evidence-based care uses treatments and supportive approaches that have been systematically tested to determine their efficiency and value to the patient. Scientific evidence helps health care policy makers allocate resources efficiently. Doctors and families can choose treatments proven to be effective, both clinically and financially, with fewest side effects. Evidence based care is achieved through research and scientific review, guideline development and evaluation. Treating doctors must also understand the evidence, as well as potential risks and benefits for the individual child. Collaborative research, clinical care and family support to benefit the majority of children can only be developed through inclusive meetings with a real-world focus. 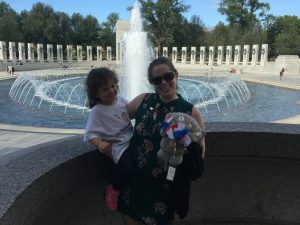 One Retinoblastoma World gathers together eye and cancer specialists, researchers, parent and survivor advocates from around the world to pursue of best possible care. This global community shares the mission to ensure that every caregiver for retinoblastoma has access to appropriate knowledge, skills, resources and collaborative opportunity to enable high quality evidence based care for each child, survivor and family. In October 2012, we hosted the first One Rb World meeting in London. The second meeting took place in Toronto in October 2014. The third will be held in Dublin, Ireland in 2016. These meetings have been timed to coincide with the world congress of the International Society of Paediatric Oncology (SIOP), ensuring maximum participation by the global paediatric oncology community caring for children with retinoblastoma. Delegates also included ophthalmologists, specialist nurses, researchers, parents and survivors. The One Rb World meeting programme focuses discussion on early diagnosis, medical care, family support, global collaboration and resource mobilization. Each session combines presentations and round-table discussion to identify practical solutions to grow effective infrastructure, facilities, resources, knowledge and skills for effective care of all children with retinoblastoma. 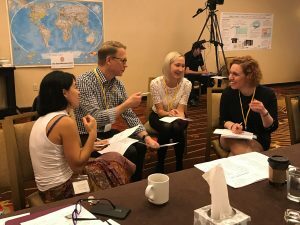 The fully interactive working meetings encourage collaborative effort and networking among the multidisciplinary delegation, focused on building a solid foundation to support rigorous international multi-centre research. This collaboration will ultimately build greater knowledge and scientific evidence to improve survival, vision outcomes and psychosocial care for all children, families and survivors. One Rb World is not a program of any specific organization. We are an open community of people who care passionately about improving cure of children with retinoblastoma, and quality of life among survivors and children who cannot be cured. We follow a constellation model of collaborative leadership that supports multi-organization partnerships and inspires innovative thinking and problem solving. are growing a global research community to increase communication and collaborative effort to advance evidence based care. We support the development and use of evidence-based best practice guidelines to encourage common standards of care and drive valuable research forward. We are compiling a directory of retinoblastoma treatment facilities to help parents, survivors and doctors find the best places for treatment and follow up care, and stimulate a collaborative global community to improve care.